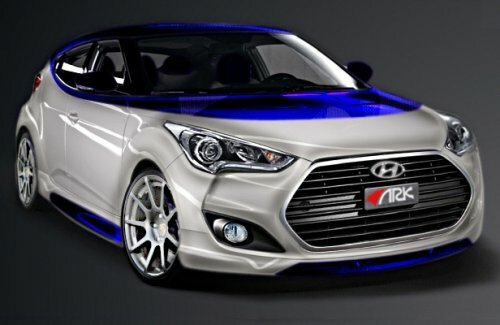 SEMA is just 12 days away and today we get out second look at a car modified by the folks at ARK Performance with their take on the unique 4-door Korean hatchback in the form of the Hyundai Veloster Alpine Edition. The ARK Performance Veloster Alpine Edition is based on the base (non-turbocharged) version of the sporty little Veloster although the image on the right looks a great deal like a customized version of the Veloster Turbo. This is due to the heavy amount of external modifications from ARK Performance that are accompanied by improvements inside and under the hood for a unique, high performance version of the efficient Veloster. The ARK Performance Veloster Alpine Edition coming to the 2012 SEMA Show begins on the outside with an ARK Performance Adro body kit that adds flared front fenders, side skirts, a rear fascia, a carbon fiber rear wing and a front fascia that looks remarkably like the front end of the factory-offered Veloster Turbo with the massive hexagonal grille opening. Next, a Seibon carbon fiber hood and deck lid have been added to reduce weight while new headlights and taillights from 180 Customs add a more unique look. Finally, ARK added NRG front and rear tow hooks and painted the exterior pearl white with bright blue accents. Inside, the ARK Performance Veloster Alpine Edition features custom appointments by JPM Coachworks on to the seats, the instrument panel, the shifter, the center arm rest, the headliner, the visors and the steering wheel with custom soft touch interior materials from HEXIS. No pictures have been offered of the interior but we can expect it to be pretty flashy…in fine SEMA form. Next, ARK Performance turned their attention to the drivetrain of the Veloster Alpine Edition beginning with the 1.6L 4-cylinder engine which puts out 138 horsepower. ARK added an in-house turbo package complete with a full exhaust system, a test pipe, turbo piping and an oil cooler. Next, a K&N cold air intake package, a Nitrous Express Proton Kit, a Koyo Radiator and custom tuning by BTRcc increases the intake to an impressive 232 horsepower and 240lb-ft of torque – making it quite a bit more powerful than even the Veloster Turbo (201hp/195tq). Finally, ARK Performance wanted to make sure that their Veloster Alpine Edition handles and stops just as well as it accelerates so they added an ARK Performance DTP coilover suspension setup, an ARK big brake package, an ARK upper strut bar, Ray’s Gramlight 57Xtreme Wheels wrapped in Nitto INVO tires. So far, we only have the one image of the ARK Performance Veloster Alpine Edition that is shown above on the right but in right around two weeks – we will have gotten out first look at this and all of the customized cars at the 2012 SEMA Show in Las Vegas. Stay tuned to TorqueNews.com for all of your coverage from SEMA 2012 along with the rest of the happenings in the automotive universe.